Culture is the characteristics and habits of a group of people. It involves their clothes, food, music, religion, language and many more. One example of Earlham High School culture is the many sporting events of a variety of different sports like football, volleyball, basketball, track and many more. Another example of Earlham High School culture is the different foods the cooks at our school serve. We have different breakfasts to choose from every morning and we have a variety of lunches made everyday. Culture is the characteristics and knowledge of a particular group of people, encompassing language, religion, cuisine, social habits, music and arts. It comes from the people way before us and how they lived. We use our own culture in our everyday lives from the clothes we wear everyday and the language we speak. Also, culture is in our lives from the food we eat everyday. You will find different cultures and ways of life all around the globe because they all have different religions and beliefs. People around the world listen to different kinds of music, wear different clothes, and eat different food. I think globalization could both bring cultures together or force them further apart. One way that it could bring cultures together is that people will recognize the different cultures and learn about those cultures. They could also get forced apart because people might think their own culture is the correct one and everyone else is wrong so it could bring conflict. Language is a big part of culture. Languages come from people way before us when the culture was formed. You have to be able to communicate with the people around you in the same culture, so you use a language. 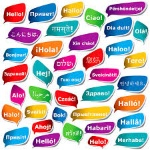 Languages are distributed into 2 groups: language families, language branches and language groups. Language families is a collection of languages related through a common ancestral language. Language Branches is a collection of languages within a family related through a common ancestral language. Differences are not as significant or as old as between families. Language groups are a collection of languages within a branch that share a common origin in the relatively recent past and display similar grammar and vocabulary. In a certain region a lot of people might speak a certain language, but not every single person in that region or area speak that language. The most common spoken language in that place will override other languages and be known as the main language for that place. For example, when you think of the language for America, you think of English, but not every person that lives in America speak English, some might speak only Spanish or a different language. Language is important to the cultural and national identity because if you were from the US and you wanted to travel to Mexico, it is important to know that not everyone will be able to speak English and that the most common language spoken there is Spanish. You can’t expect to be able to talk to everyone from there easily. It could unify people because it might make people to want to learn the other languages and travel to new places that speak that language. It might separate people because they are don’t want to learn a new language and they won’t travel to new places with different languages, so they are separated. Slang language affects culture because a work could mean one thing in a certain area or region, but mean something completely different somewhere else. For example, people know a toboggan is a sled here, but in the south, people know it as a hat for cold, winter days. That’s how slang affects culture and is unique to each culture. Religions are split into 2 different groups: universalizing religions and ethnic religions. Then there is 3 branches of universalizing religions: branch, denomination, and a sect. A branch is a large fundamental division within a religion. A denomination is a division of a branch that unites a number of local congregations in a single legal administrative body. A sect is a relatively small group that has broken away from an established denomination. Universalizing religions attempt to be global by appealing to all people regardless of location or culture. Ethnic religions appeal primarily to one group of people living in one place. They often remain within the culture where they originated and they typically have relatively more clustered distributions than do universalizing religions. Christianity is an example of an universalizing religion with major branches of Roman Catholic, Protestant and Orthodox. Animism is an example of an ethnic religion whose followers believe that inanimate objects are natural events, such as natural disaster, have spirits and conscious life. When I compared each other the major religions, Christianity, Judaism, Hinduism, Islam and Buddhism, one of the major similarities is that they all worship one God. They also all have their own specific place that they go to at a certain time and day to pray and worship their God. Another similarity is that they all believe in their religion without really knowing for sure it is correct because no one actually knows. Conflicts arise from religious groups because each follower of a religion think theirs is the correct one and everyone else is wrong. This can bring lots of violence and war. Since no one actually knows which one is right, the winner is usually the one with the most followers. They also may fight over land and who owns it. Each culture and region want theirs to keep increasing and getting bigger so they all want more land and that can also cause conflict and violence. The women’s jobs in most religions are to stay at home and take care of their kids and the house. They make food and work at home all day, while the men are out working and making money. Men will be the ones fighting in wars and other important jobs.